Although signs of Spring are finally making an appearance, the first snowdrops and catkins on trees, winter frosts are still nipping at our toes, so why not embrace the comfort of a fondue night. With Valentine’s Day approaching and staying in being the new going out, now is a perfect time to go retro, dig out your fondue kit and hunker down for a romantic evening à deux. 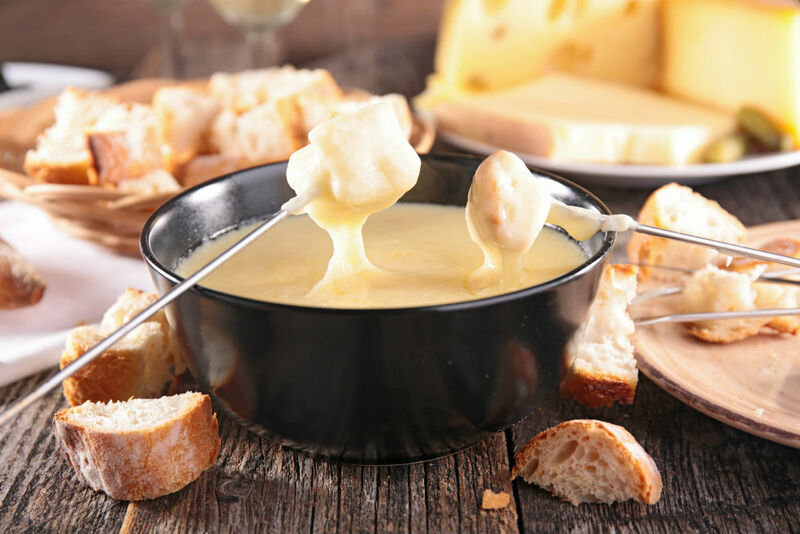 Fondue nights are also a lovely way to cherish some family time and children will love the ritual of dipping bread into the oozy, melted cheese. The word Fondue comes from the French word fondre meaning to melt. It was invented in Switzerland in the eighteenth century, and like many food discoveries, was born out necessity. Rural alpine villagers depended upon cheese, wine and bread to see them through the long, cold winter months. The cheese that was made in the summer had usually dried out by winter so to use up the stale bread and hard cheese they would melt the cheese with wine over an open fire and then dunk the pieces of bread in for a warming, comforting meal. The popularity of the fondue grew in the 1930’s when the Swiss Cheese Union had a campaign to increase cheese consumption. People from all walks of life and various financial means began enjoying this delicious dish and after World War Two it became the Swiss national dish, representing unity and a national identity. Swiss families still find solace in this traditional dish, enjoying it together as a family, embracing good food and quality time together. The fondue is conventionally made in an earthenware pot, known as a caquelon, which heats evenly and retains heat. The cheese used varies from region to region but usually contains two cheeses one of which is often Gruyere for its melting properties. You heat small pieces of steak in hot oil until cooked and then dip into the sauce of your choice such as hollandaise, horseradish or mustard. This one will definitely be a hit with children and the chocolate lovers in your life. Heat some cream until simmering, add the chocolate, stirring until melted, and then enjoy with strawberries, bananas or even pieces of cookie. If you’re looking for the perfect kitchen, contact our specialists at Black Rok for some friendly advice.